Planning a new corporate headquarters can be a dream project for any in-house facilities professional. 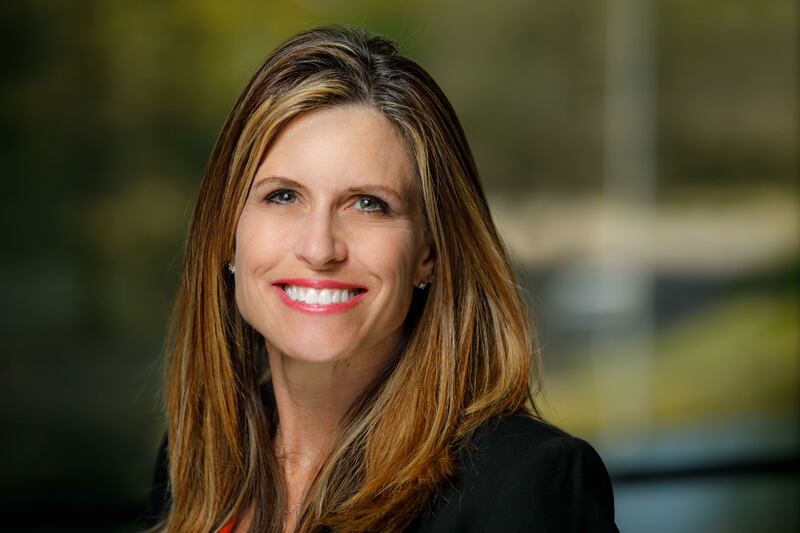 And certainly, the proposed new headquarters for RealPage, an international property-management software developer, offered Sandy Seaton plenty of career-defining challenges and opportunities as Vice President of Corporate Real Estate. Among those challenges was the fast-track, nine-month schedule in which Seaton needed to balance site selection, planning, design, construction and phased move-in while keeping employees informed of progress and business fully operational during the entire process. For RealPage employees, the bustle of construction was a daily part of the workplace. Throughout the fast-paced and sometimes-hectic process, Seaton knew that employees would benefit from a new world-class Dallas headquarters—even if they had to negotiate sawdust and construction noise in the interim. 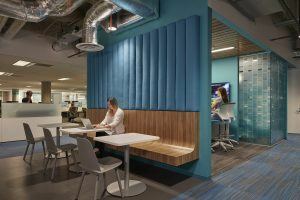 That challenge was softened, however, by Seaton’s vision of the new workplace and how it would positively transform the daily experience of employees, client relations, and the company’s overall success. RealPage has experienced extensive growth since its founding in 1998. In response, the company wanted to consolidate its Dallas, Texas, headquarters under a single 400,000-square-foot space, from four separate physical buildings that were siloed according to departments and functions. “The goal was to build something innovative that could flexibly accommodate our changing needs as we continued to grow and evolve over the coming years—culturally and operationally,” Seaton says. Essentially, the new headquarters was an opportunity to bring the teams together and rethink the corporate culture and how employees work together. But to get to that ideal place, the company had to work fast. The leases on their current spaces were set to expire. To help with the vision and timeframe, Seaton reached out to Melissa Pesci, AIA, LEED AP, of the architecture firm HGA, who had worked on several previous RealPage locations in San Francisco, Irvine, Greenville, Seattle, and Barcelona. In talking with Pesci, Seaton emphasized advancing the culture and ideals of RealPage—specifically how colleagues work and communicate. The new workplace, she said, should express a forward-looking vision that reflects their high-tech role as a software developer and promotes collaboration and efficiency. 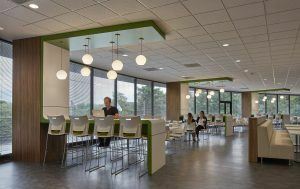 After analyzing several options and selecting a four-story low-rise commercial building and connected second floor of an adjacent mid-rise building in a standard office park, Seaton worked with Pesci to design the new RealPage Corporate Headquarters. There was nothing particularly inspiring about the building—but it offered potential, essentially a blank slate to create a new image for RealPage. As such, Seaton and her team started by gutting the building and rethinking the floorplates as a series of interconnected departmental neighborhoods—easily accessible to each other. 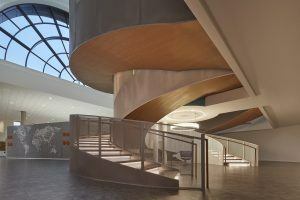 They replaced the generic ground-level façade with storefront windows to bring in daylight, reconfigured the existing interior into an open plan centered on an atrium and helix staircase, introduced color-coded neighborhoods that identify departments, added flexible workstations that easily reconfigure, and interconnected it all with a central circulation spine that leads to shared conference rooms. Finally, they added such lifestyle amenities as a farmers’ market-style cafeteria and coffee bar, gym, training and conference center, film and sound studio, and auditorium—all planned to promote shared cultural values and encourage interaction among departments. Soon after they started renovations, the company’s 1,600 employees began migrating over in phases. To meet the tight deadline, Seaton worked with HGA and subcontractors to perform multiple in-house services to maximize time and budget, from interior design and architecture, to engineering, lighting design, and environmental graphics. Despite the progress, Seaton met road bumps along the way as a major storm briefly interrupted material supplies and another global company hired away many local subcontractors for its new headquarters under construction. Still, the deadline loomed. Seaton says that given the complex web of relationships and all the potential disruptions to the business, a solid team and clear communication among all parties was crucial. Several times a month, she met with the CEO to make sure that she and her team were in lockstep with the company’s overall strategy and that any quick decisions could be executed efficiently. Today, RealPage employees come to a high-tech, collaborative headquarters. Because of the layout, every employee has direct sightlines to windows. Employees cluster in neighborhoods, where each community has a hub that offers coffee, printing, and a huddle room. Looking back on what they have and what it took to get there, Seaton says one word comes to mind—amazement. Employees really started to embrace what they had. The positive comments continue to affirm that we designed space that is relevant, collaborative, and engaging.